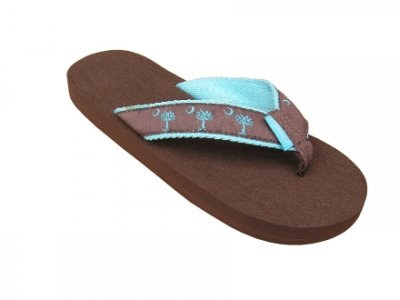 Mudpies to Dragonflies: Flip Flop Mama! I've never liked flip flops. I really hate anything stuck between my toes. And I don't really like looking at my ugly feet. Like I said, I'm not a huge fan of flip flops. Now, I always buy my boys a new pair for the summer. There was even a post last summer about S' flip flops, but I've not owned a pair since high school... at least. I really want something easy for the trips to the pool and beach, but I just can't bring myself to waddle around (because that is how I walk with plastic shoved between my toes) with flip flops. My friend, Susan (the one that lives close to me) and my teaching assistant, Patty, both tell me that I just need to buy better flops that use ribbon or cloth for the thingie between the toe. Yeah, right. I guess I'm going to be a Flip Flop Mama, after all! I am constantly made fun of for wearing Birkenstocks but the truth is I wear them because I hate having something between my toes. It drives me crazy. I will say though that these are much cuter than my Birkenstocks. I too, cant' stand anything between my toes. My other problem is I can't wear shoes that don't have a back on them, because I *will* trip and fall, or they come off which then of course causes me to trip and fall! And of course nowadays it's hard to find shoes with backs! These will be great with your bathing suit. What a perfect match. I hope you'll find them comfortable. This suit is adorable - we sell them where I work and I have been admiring it! I think Birks go with anything (even socks! ), but that's just me. The flip flops are cute and suit the suit, though. :) Crocs make a style of sandal now, with a slim band across the foot & heel and nothing between the toe, which you might find useful in the future, when your flip flops wear out.